Hurricanes and global warming: 5 years post Katrina | Climate Etc. ← Welcome to Climate Etc. The 2005 Atlantic hurricane season saw hurricane activity and devastation that was unprecedented in the historical record. In August 2005, Kerry Emanuel published a paper in Nature associating the increase in sea surface temperature (SST) since 1950 with an increase in maximum hurricane potential intensity and the destructive capacity of hurricanes, focusing on hurricanes in the North Atlantic and North Pacific. Webster et al. in an article published in Science (published 5 yrs ago this week) showed that while the total number of hurricanes has not increased globally since 1970, the proportion of category 4 and 5 hurricanes had doubled, implying that the distribution of hurricane intensity has shifted towards more intense hurricanes. The coincidental (edit) timing of the publication of these papers within weeks of Hurricane Katrina’s devastation focused intense media attention on the topic of greenhouse warming and increasing hurricane intensity, although neither Emanuel or Webster et al. directly attributed the tropical cyclone changes to greenhouse warming. Five years after Hurricane Katrina, hundreds of papers have been published that relate in some way to the subject of hurricanes and climate variability/change. We also have 5 years of additional data. Major assessments have been undertaken by three different international and national groups. What have we learned? What don’t we know? How should we assess the risk from future hurricanes? Since 2005, assessments of climate change detection and attribution research with regard to tropical cyclones have been undertaken by two international groups (the IPCC and the WMO) plus the U.S. Climate Change Science Program. Below, I highlight the major conclusions from each of the three assessment reports; for full context of the statements cited here, please see the original sources. All likelihood statements follow the conventions of the IPCC. How should we interpret these differences in conclusions and confidence levels of the three different assessments? One issue is the time derivative factor of comparing assessments published in 2007, 2008, and 2010. The differences in confidence levels of the three different assessments reflect different groups of experts (with some overlap). The basis for assessing confidence levels used in all three assessments (following Moss and Schneider 2000) expresses quantitative levels of confidence based on the amount of evidence (number of sources of information) and the degree of agreement (consensus) among experts. Given the explicit reliance on the consensus among experts in the confidence assessment, it is not difficult to see how different groups of experts can assess the same information in different ways. in which evidence for a proposition is represented as green, evidence against is represented as red, and residual uncertainty is represented as white. The white area reflects uncommitted belief, which can be associated with uncertainty in evidence or unknowns. This representation gives uncertainty an explicit place in the assessment and requires consideration of both the known unknowns and the unknown unknowns. The differences in the three assessments can then be interpreted as different views on the size of the white area and what it actually contains. So, given that there have been three major assessments in the past three years, what is the point of an individual (i.e. me, with my individual interests, biases, misconceptions and ignorance) conducting yet another assessment, and posting it on a blog? I am providing a different type of assessment, one that focuses on the white region of the Italian flag diagram, i.e. the uncertainties and the knowledge frontier. Sitting squarely in the white region are a host of issues that have barely been addressed in the other assessments, issues that relate to physical processes and the climate dynamics of hurricanes. I view consideration of these issues to be essential for developing confidence in our statements about attribution and projections of tropical cyclone activity. And most importantly, I am posting my assessment on a blog to stimulate dialogue on this topic. But before pondering the knowledge frontier, first an update on the Webster et al. (2005) paper. Detection of an increase in hurricane intensity? 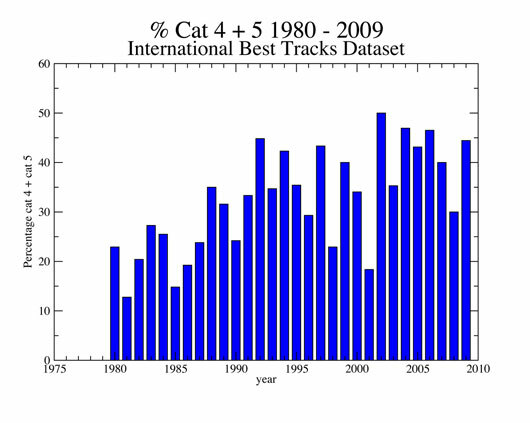 Data from 1980-2009 from the IBTrACS (DATA) are used to recreate the Webster et al. analysis. Note, data from the 1970’s are not used in this new analysis owing to the substantial uncertainty of data in the southern hemisphere. No statistical analysis of the data is presented here; I leave that to others to decide the best way to assess the magnitude and significance of the trend. 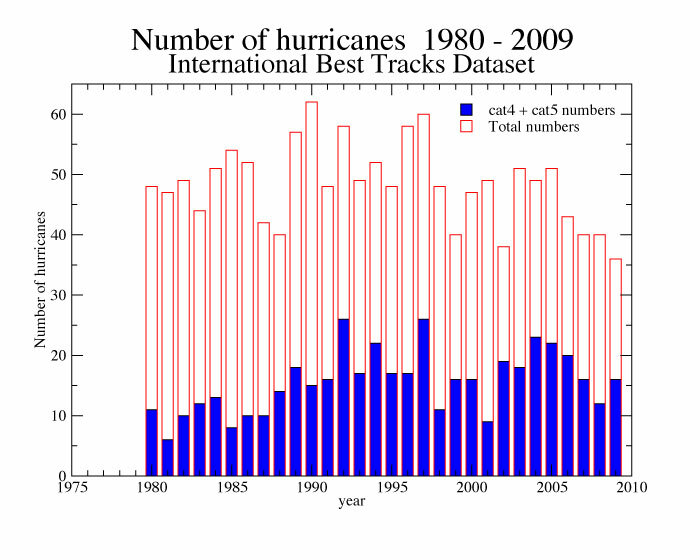 The total number of hurricanes shows no overall trend, with 2007, 2008, and 2009 ranking among the 4 lowest totals in the record. The numbers of category 4 and 5 hurricanes during 2007 2008, and 2009 are also correspondingly low. However, consideration of the % of category 4 and 5 hurricanes shows a continued overall increase, with 2002, 2004 and 2006 ranking as the highest years in the record, and all years since 2004 are above average except for 2008. Further support for an increase in the proportion of the most intense hurricanes is provided by Elsner et al. (using the Kossin et al. satellite dataset), see esp Fig 1b. This increase in the % of most intense hurricanes is dominated by increases in the North Atlantic and also the North and South Indian Oceans. Hence, the available information that we have on global hurricane intensity supports the original findings of Webster et al. of a global increase in the % of category 4 and 5 hurricanes, although the trend is somewhat smaller than that found by Webster et al. The increase in the % of category 4 and 5 hurricanes reflects a shift in the distribution of hurricane intensities, i.e. a fattening of the tail of the intensity distribution. Back to the white area in the Italian flag diagram: uncertainty and unknowns that comprise the frontier of knowledge. My selection of topics at the knowledge frontier is by no means complete, but reflects questions that have accumulated in my own mind regarding the causal chain that links the formation and intensification of hurricanes to climate dynamics. And I note in advance my bias for citing recent papers from the Georgia Tech group. I anticipate that others will expand on this list of papers. Maximum potential intensity theory. In Emanuel (2005) and Webster et al. (2005), the theory of maximum potential intensity (MPI; Emanuel 1988) was invoked to explain the link between increasing sea surface temperature and increasing hurricane intensity. MPI theory is widely accepted by the hurricane community, and is used in operational forecasts of hurricane intensity. However, several critiques of MPI have raised questions about its validity. Smith et al. (2008) argue that MPI is derived from a flawed model that makes the tacit assumption of gradient wind balance in the atmospheric boundary layer, a layer that owes its existence to gradient wind imbalance in the radial momentum equation. Russian biophysicists Makarieva and Gorshov (2009 , 2010) critique the application of the dissipative heat engine model used by Emanuel used in the development of MPI (note I understand that Emanuel has submitted a response to this paper). Cione et al. (2000) questions the conventional wisdom of the TC inflow layer used to derive MPI, finding that low level inflow is not isothermal, not constant with respect to surface specific humidity, and not in near thermodynamic equilibrium with the sea surface. Lackman and Yablonsky (2004) point out the importance of the precipitation mass sink in the pressure drop in a hurricane, an effect that is not included in MPI theory. Rethinking of the maximum potential intensity of hurricanes seems to be in order. Hurricanes and modes of natural climate variability. Interannual and multidecadal modes of climate variability have long been known to influence hurricane activity. Recent research by Kim et al. has highlighted the impact of the increasingly frequently Modoki El Nino on hurricane activity in the Atlantic and the Pacific. The Pacific Decadal Oscillation (PDO) has a dominant impact on hurricane variability in the Pacific, and modulates the frequencies of El Nino/La Nina. DiLorenzo has identified a new multidecadal oscillation in the Pacifc, the North Pacific Gyre Oscillation (NPGO) that is independent of PDO. In a follow up paper, DiLorenzo et al. identify the central Pacific warming (Modoki) as a different model from ENSO, that is the high frequency expression of the NPGO. I suspect that the combination of the PDO and NPGO can explain much of the variability in Ryan Maue’s analysis of Accumulated Cyclone Energy diagram (reference to Maue’s paper added – edit), given that the majority of global hurricanes occur in the Pacific. In the Atlantic, the AMO, NAO, and AMM have all been invoked to explain variability in the Atlantic in numerous papers, and I have argued (in an unpublished presentation) that the PDO also influences Atlantic hurricane activity on decadal time scales. And finally, Elsner presents intriguing evidence for a relation between Caribbean hurricane activity and the sunspot cycle. Inferences of hurricane activity from climate model simulations. Because of the coarse resolution of climate models, such inferences require either statistical relations between the model predicted fields and hurricane activity, or some sort of downscaling with a seeding mechanism. The seeding is required because even at much higher resolutions, models do not do a good job of predicting genesis (formation) of tropical cyclones. Prediction of hurricane intensity is very challenging, even in an operational forecasting environment using high-resolution models for a hurricane that has already formed. Given these issues with understanding and modeling tropical cyclogenesis and intensification, what kind of confidence should we have in inferences of hurricane statistics from climate model simulations? While such inferences are becoming increasingly sophisticated (e.g. Bender et al. 2010, Emanuel et al. 2008), I find it difficult to take them with more than a grain of salt: the seeding is artificial and intensification mechanisms are uncertain. Further, issues of climate model structural deficiencies of relevance to hurricane development have been raised by Emanuel (paper 4A.4) with regards to the substantial disagreement between modeled and observed values of upper topospheric temperature and humidity. Hurricane frequency and intensity in the North Atlantic has likely [>66%] increased since 1970. The transition from the cold to warm phase of the AMO is a plausible explanation for this increase. Attribution of a portion of the increase in hurricane intensity to AGW would require (at minimum) resolution of the problems with the intensities during the period of 1945-1970 (encompassing the previous warm period of the AMO). It is more likely than not [>50%] that the % of category 4 and 5 hurricanes has increased globally since 1980. Increased confidence requires continued efforts to reprocess the data. Attribution of any portion of this increase to anthropogenic global warming would require careful examination of the data and modes of natural variability in each of the regions where hurricanes occur. It is more likely than not [>50%] that the maximum intensity of the strongest hurricanes would increase in a warmer climate. While there is an absence of evidence against this hypothesis, there are also substantial uncertainties in the observations and theory (i.e. a preponderance of green with no red, but a substantial white region). I do not currently place any confidence in climate model projections of future hurricane activity. At the same time, I recognize the substantial advances made on this in recent years particularly by the GFDL group and ongoing efforts by several other groups as well. Note regarding comments: This thread will be heavily moderated for relevance to science of hurricanes and the assessment of the science. More general discussion on the hurricane topic is welcome on the Open thread. I will participate on both this thread and on the Open thread. A good litmus test for whether you should submit your post to this thread or the Open thread is whether or not you have read any of the scientific papers linked to in this thread. If you would like a relatively easy to read “primer” on this subject, i recommend this. That statement could have been written back in the 1800’s when the country was first being settled and development took place in these hurricane / flood zones. People know when they built a home on a flood plain, that it is called a flood plain for a reason….and when you build a home, or a city, or a subdivision which is essentially below sea level, you are going to get nailed eventually. However, it is a free country and if you are prepared to lose everything , every so many years, this is your choice. Disaster relief is the key, so is stricter building codes and higher insurance for these folks. History tells us that there were hurricanes in the past and will be hurricanes in the future. The theory that mankinds presence on the planet is having a cause / effect on the intensity of hurricanes is yet to be proven beyond reasonable doubt. Interesting hypothesis , lots of data, but we can’t blame it on man…yet…. Ian, the 60’s, 70’s, and 80’s were a relative quiet period in the North Atlantic, with relative few landfalls (there was substantially greater activity in the 30’s, 40’s and 50’s). Alot of the development in Florida and on the Gulf coast occurred during the quiet period, when people were lulled into complacency by the relative lack of hurricane activity. The 2004 and 2005 hurricane seasons in particular were a major wake up call particularly for Florida, which got absolutely hammered. Why does quantitative hurricane history begin in 1970? The headline includes a ‘teaser’ linkage to “Global Warming”. I guess you meant NH Warming. from ‘the time before Global Warming’, whatever that might be. Hard to imagine that the operator of the world’s largest blue water navy was not keeping records of hurricanes for quite awhile. Feel free to toss or hold this if it is not the way you want to start the first science thread. RuhRoh, this is a good question, thank you. Satellite observations started ca the 1960’s, and became reasonably reliable platforms for observing hurricanes around 1970, although many of the early inferences of hurricanes from satellite data were made using methods that are now known to be not very good. Prior to the satellite era, we have weather reconnaissance flights in the Atlantic and North Pacific, back to 1945 (note this is why Kerry Emanuel’s 2005 paper focused on the Atlantic and North Pacific). These data are invaluable, but prior to 1970 the methods for determining the intensity of major hurricanes are known to be biased, and efforts to adjust the intensities haven’t been very satisfactory. Prior to 1945, we observations at landfall and also observations from ships. The best dataset is for the Atlantic, extending back to the mid 19th century. This data set is in the process of being “cleaned up.” The interpretation of biases and likely missed storms in this dataset is hotly debated. When attempting to draw sound conclusions on climate trends, going back only to 1980 simply doesn’t suffice. If that’s the only data one has, then of course it’s where you start. But there are plenty of reliable, non-satellite records going back decades, well beyond 1980. While not as good as the satelite data, but they still can be used. Whenever I see the word “model”, my reaction is “Has the model been validated?” Invariabely in climate science the answer is no. In which case, the outut of any such model is useless. A nice introductory post. I wonder if we could expand a bit on the issue of El Niño CP/Modoki, its expected and ostensibly observed increase, and influence on North Atlantic and North Pacific TCs. – The number of El Niño Modokis is expected to increase in a warming world, perhaps through a flattening of Pacific warm pool’s thermocline. – El Niño Modoki facilitates North Atlantic TC activity, perhaps through a reduction in wind shear. – El Niño Modoki facilitates North Pacific TC activity, perhaps through a change to cyclonic rather than anticyclonic circulation in the basin. – There is tentative observational evidence that El Niño Modokis are increasing, though no attribution to anthropogenic warming is possible at this time. Yeh, Sang-Wook, et al. (2009): El Niño in a changing climate. Nature, 461, 511-514, doi:10.1038/nature08316. Kim, Hye-Mi, et al. (2009): Impact of Shifting Patterns of Pacific Ocean Warming on North Atlantic Tropical Cyclones. Science, 325, 5936, 77-80, doi:10.1126/science.1174062. Chen, G., and C.-Y. Tam (2010): Different impacts of two kinds of Pacific Ocean warming on tropical cyclone frequency over the western North Pacific, Geophysical Research Letters, 37, L01803, doi:10.1029/2009GL041708. Lee, T., and M. J. McPhaden (2010): Increasing intensity of El Niño in the central-equatorial Pacific, Geophysical Research Letters, 37, L14603, doi:10.1029/2010GL044007. Thingsbreak, the Modoki issue is a very interesting one. We are just starting to understand this. In terms of why the Modoki’s are increasing, we don’t know. The historical temperature record in the tropical Pacific is pretty spotty, and definitely inadequate for distinguishing central from eastern Pacific warming prior to 1920 (and probably even later than that), so we don’t have much of a historical record to work with. My colleagues Kim Cobb and Emanuele DiLorenzo are working on assembling paleo proxy data from the Pacific to try to get a handle on the oscillations prior to the mid 20th century. I think the hypothesis provided by DiLorenzo is intriguing, whereby the Modoki is the high frequency manifestation of the North Pacific Gyre Oscillation (analogous to the ENSO – PDO relationship); see the links provided in my original post. With regards to how the Modoki influences the Atlantic and Pacific TCs (note, doesn’t seem to have any influence on Indian Ocean TCs). Again, we are just scratching the surface so far on this. A warm blog in the Central Pacific will influence the wave train in the tropics and set up a different circulation pattern relative to to eastern Pacific warming (or cooling), which will manifest in altered basin circulation patterns, wind shear, humidity, and SST, all of which can contribution to modifying hurricane activity in both the Pacific and the Atlantic. I’ve emailed several experts on this topic, hoping they’ll join the discussion, we’ll see. – re “El Niño Modoki facilitates North Pacific TC activity”, we have submitted a new paper that shows the relationship between Modoki and TC activity over the entire North Pacific. In Modoki years, the westward shifting of heating moves the anomalous westerly wind and monsoon trough through the northwestern part of the western Pacific and provides a more favorable condition for the TC landfall than the conventional El Nino years. On the other hand, Modoki El Nino produces a large suppression of TC activity in the eastern Pacific basin. – Is there any indication that climate change may be playing a role in creating more Modoki? There are at least 2 possibilities: Modoki occurrence is part of a reoccurring natural cycle such as the Pacific multidecadal oscillation, or it may be the result of a warming world. There are barrier to saying too much at this stage because our data record is poor. Although we think this is a recent phenomenon do not know if it has occurred regularly in the past. Kim, thank you for stopping by and making a post here. Thanks, Dr. Cobb. I’m looking forward to digging into the work you and your husband have been doing. I tried to catch up on CP/Modoki papers about a month ago, but obviously my Web of Science search didn’t pick up the paper submitted to GRL. I appreciate you taking the time to weigh in here. I am troubled that Katrina is usually associated with the most intense of all cyclonic storms to hit the US. It made landfall as a Cat 2 as I with its destructive force centered on coastal Mississippi and Alabama. The New Orleans situation was caused by failing flood control structures. A combination of unacceptable engineering, poor maintenance, and the destruction to protective barrier islands that resulted from channeling the Mississippi River, and lack of political will led to to the flood control system failures. The proof that Katrina was not one of the worst is the recovery and rebuilding that occurred in Alabama and Mississippi. The New Orleans situation is still much the same in spite of the billions of dollars spent under the political leadership of Gov. Jindahl. Perhaps the obvious should be acknowledged, that is improvident to build and maintain a major city on land below sea level. New Orleans remains vulnerable to another flood control failure unless and until the barrier island protection is restored by dispersing the delta flows to numerous outlets so that sediment is available to rebuild those island. So far the political will, leadership and funding seems to be missing at the federal level. How do we know that the Atlantic surface temperature has increased over the last 100 years? Also I cannot understand how tropical sea surface temperatures can increase due to human-caused warming. The oceans contain almost all of the energy driving the climate and the energy flow is from ocean to atmosphere. That energy will get out from the oceans regardless of whether we are capable of warming the air above. Please transfer to the open thread if that is more appropriate. Philip, the observational data base from ships for the tropical north Atlantic SST is pretty good. Additional carbon dioxide in the atmosphere provides an enhanced infrared radiative flux from the atmosphere, which warms the surface. This warming is mixed through the upper ocean mixed layer. The ocean provides heat and moisture to the atmosphere through evaporation and turbulent heat exchange. So the ocean and the atmosphere exchange heat; the addition of carbon dioxide to the atmosphere (plus more water vapor as a result of evaporation) means that there is more heat in the system. If you would like to learn more about heat transfer and radiative transfer, I recommend the scienceofdoom blog. Given the vast range of temperatures of the Atlantic, in all three dimensions and with the seasons, I find it hard to accept that we have a good set of data from which to draw such conclusions. But if you say that is the case, then I am willing to accept it for the time being. Infrared radiation will be absorbed in the skin layer of the oceans and will cause increased evaporation, resulting in local cooling, rather than mixing and warming the water at depth. Only SW radiation from the sun will penetrate the water and cause warming. There has to be a net energy flux from the oceans to the atmosphere otherwise the oceans would continue to increase in temperature. For sure, more of this will occur at high latitudes where the air is cooler, but at all latitudes the flux is from water to air. When you say “there is more heat in the system”, I think you mean “there is more energy in the system”. Thanks for the reference to the scienceofdoom blog, which I enjoy reading from time to time; but I have been working in the field of heat transfer and fluid flow for longer than I care to remember. Eli, the MPI is a hypothetical intensity, it is not an actual intensity, so we still need actual intensity, since hurricanes rarely achieve their maximum potential. Yes there are two separate issues, number and intensity; indices like ACE and PDI integrate both number and intensity (plus duration). For the most part, I prefer to consider number and intensity separately. Note, whereas we do have a theories for hurricane intensity (albeit imperfect ones), we don’t have any theories that explain the frequency hurricanes (instead of 50 each year, why not 5 or 500?). We have certain empirical relations, which provide the basis for seasonal forecast such as produced by NOAA and the Colorado State group. But this is something we dont really understand, and climate model simulations of future hurricane activity provide artificial “seeds” to produce hurricanes. Eli, one other comment. The main critique of the Saffir Simpson intensity scale is that it neglects the impact of hurricane horizontal size, which can have a sizable impact on damage. In particular, Hurricane Ike of 2008 was the 3rd costliest U.S. hurricane on record, even tho it was Cat 2 at landfall. Ike was so damaging because of its large horizontal extent, which increases storm surge, rainfall, and tornadoes. Several new classification schemes have been proposed, for example see here, but the National Hurricane Center is resisting any changes. Perhaps I’ve not made all the connections, but the article’s policy conclusions do not appear to flow from the “science” of the rest of the article. Rather the article’s concluding references to a “lemming like march to the sea” and the “call on our leaders” to do this and that seems patently a non sequitur. Indeed, per the rules for posting to this thread, as I can best understand them, the article’s advice on how decision makers should respond belongs in the Open Thread, if posted by a reader. While the article’s policy discussion and recommendations have a good common-sense quality to them, they require no scientific expertise to derive–of course, vulnerability to hurricane damage will increase as development increases in coastal areas exposed to hurricanes. I ask, then, is the policy recommendation attached to this article not some sort of reflexive attempt, of the type that seems to be especially prominent in climate science, to be seen as a “player” in public policy advocacy? Possibly with the unspoken understanding that science will not be funded, unless those providing the funding are given “scientific” cover for their political/business agendas? Mike, at the time the policy recommendation was made (summer 2006), there was a great deal of hysteria about the prospects of more intense hurricanes as a result of global warming, and the scientific debate fueled by the media and public crisis mode in the aftermath of Katrina was, well I don’t even know how to describe it. Hurricane researchers were called to testify in congress (I testified twice). The point of the policy recommendation is that policies related to hurricanes should not focus on the global warming issue which remains highly uncertain with regards to hurricanes, but to focus on land use policies, etc. I should be working now but I find several points on the statistics of this post to be weak. While interesting, this seems completely meaningless in terms of policy when you consider that the general number of storms has been reduced and the particularly low point at which data started being taken. In my opinion if there were an unstable atmospheric condition which worked against the formation of hurricanes the weaker storms wouldn’t form, after one did however, it alters the atmospheric conditions around it and you see a greater proportion (but less of) stronger storms. “Hurricane frequency and intensity in the North Atlantic has likely [>66%] increased since 1970. ” – I doubt that this one sigma statement of increase can be demonstrated to my satisfaction given the data but one sigma is statistically very very low. I also expect more hurricanes in warmer weather, but how many and will it be statistically measurable are very important keys. IMO, It’s also incorrect to state we have an increasing vulnerability. I’ve seen per-capita studies which show the opposite. While cash damage is higher, on a per-home and per life basis, it has been reduced significantly. Early warning and building codes have been key of course to these successes. I’ll leave you alone on policy because we don’t agree on that either, but really you are making too strong of conclusions from the data. I suspect it’s your immersion in hurricane climate models which has reinforced your conclusions. Anyway, thanks for the post, I do understand you are the expert so feel free to correct my error. The reason why an increase in higher-end North Atlantic TCs relative to even a decrease in overall storms is of concern is that these (Cat 3+) storms are responsible for something like 80% of all TC-related damage in the Atlantic. Jeff, With regards to hurricane activity as represented by ACE in Ryan Maue’s plot, I agree that this reflects an overall decrease in the last several years of integral hurricane activity. The seasonal ACE (which is what Maue plots) is the sum of the ACE for each storm and accounts for the number, strength, and duration of all tropical storms in the season. ACE is a very different metric than the % category 4 and 5 hurricanes, which only reflects the intensity of the strongest hurricanes and is insensitive to hurricane number and duration. Note, there is no reason to expect a larger number of hurricanes with warmer SST; in fact climate models are even predicting a slight decrease. It is intensity that is hypothesized to increase with warming, not number or ACE. Note, in the Atlantic (which is not what I’ve plotted, I’ve plotted global numbers), there is quite a substantial increase in the number of hurricanes since 1970, which nobody disputes (for some plots of the Atlantic time series, see my ppt). Greg Holland is the primary proponent for a large increase in Atlantic hurricane activity since 1900 (see here), but this analysis is disputed by Landsea who claims that numerous storms were missed prior to 1970, but Holland tells me he has another paper in the works that defends his position. The record since 1970 is fairly solid, although there may be some readjustments to intensity as part of the Hurdat process. There really is quite a large increase since 1970, which is attributed in large part to a change in phase of the AMO. The conclusions that I have made are more conservative than any of the other three recent assessments, I don’t think that any hurricane researchers from either side of the AGW debate would think that my conclusions are too strong. Re policy, in a 3000 word post, I spent about 100 words on policy. Re damage and vulnerability, I will leave that for others to discuss such as Roger Pielke Jr. Thanks much for the reply. I’ve learned a bit more but from the long term plots you show in your first link, I still think any attribution to warming is difficult. Thank you so much, Professor Curry, for your kind and responsive reply. Great blog! I have a real problem with the use of percent representations. 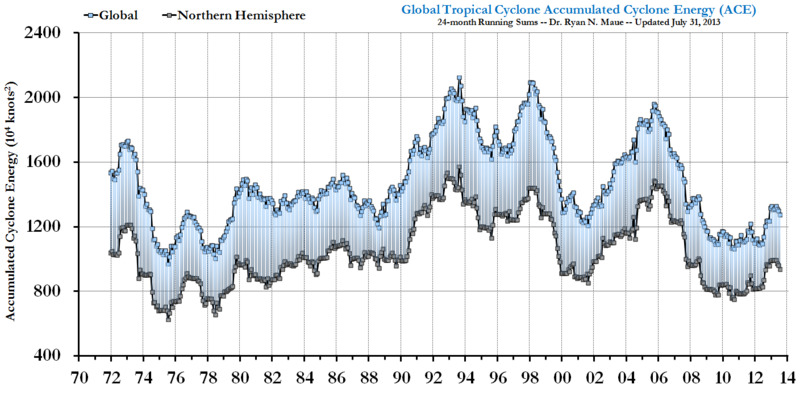 The absolute number of strong tropical cyclones went up a bit then down. This is what affects us the most. The total number including weaker ones went down more in recent times. Since warming generally affects higher latitudes more than lower, and since it is the temperature difference that drives circulation, the decrease is expected of all tropical cyclones in a period of overall warming. The surprise is that the increased evaporation due to warmer water did not result in a clear increase in the stronger storms, or that the average top speeds were not noticeably increased. Using a percent again emphasizes the result in a misleading way, seeming to indicate that something important is happening. In fact, the most important conclusion is that there are slightly fewer of the total number of storms. Leonard, the total number of cat4/5 hurricanes is of course the most important parameter in terms of impacts. However the % cat4/5 is illuminating in the context of hypotheses regarding an increase in the intensity of the strongest storms. The two numbers convey different information. While the Elsner et al. (2008) Nature paper goes off the deep end with some really questionable speculation / assertions, the notion of generating distributions is a useful endeavor. Before examining a time series of % of Cat 45 / total hurricanes, we must construct a hypothesis to test. There is no reason to believe that global TC’s from all the basins are acting in concert or are modulated in the same way by the large-scale and “evolving” climate (i.e. ENSO). Thus, the percentages per year are NOT necessarily meaningful and we must actually use the distribution analysis (though I am not a proponent of quantile regression considering the statistic significance issues). Hi Judy, I’ve been quite skeptical of the argument that the percentage of Cat 4/5 to the total number of hurricanes is related to the “trend” in SST as much as the interannual variability of SST. This was not addressed in Webster et al. (2005) nor really anywhere else on a global scale. The simplest hypothesis is that some combination of natural climate modes (with some AGW mixed in) modulates global TC genesis zones, preferred tracks, and therefore intensity & duration — in each basin individually. When you jam together the global numbers during the past 30-years, you get an upward trend. Indeed, during the past 3-years, while the number of global hurricane days has collapsed to a 30-year low (maybe longer), the ratio of major hurricane days has actually gone up to 0.4, near the 30-year record high. Shorter tracks…? But not all of the storms act the same way in a given year. The annual collection of 80-90 tropical cyclones each year do not have the same intensity/duration characteristics. Furthermore, jamming these together annually on a global scale and then extracting or deconvolving the individual components of intensity/frequency/duration (as Emanuel and others do) ascribes statistical relationships that are not real. Bob Hart and I tried to show this with our comment to Sriver and Huber’s work, but ultimately failed. With Emanuel (2005) and others filtering the yearly data, he removes the information on interannual time scales that I believe is the entire signal we are looking for. I’m fine with having an upward trend, but at least keep the variations around for physical interpretation purposes. Our original paper Hoyos et al (2006) related the trend in %Cat4/5 to SST through an analysis of shared information. Correlation analysis isn’t useful here since the correlation is dominated by the correlations with ENSO, which is of opposite sign and depends on which ocean basin dominates the numbers, and is further complicated by Modoki (which we didn’t know about at the time). The rationale for our original analysis is that the impacts on TCs of the different modes of decadal scale variability were independent in the different ocean basins. We now know that this is incorrect. My current thinking on this is that multidecadal oscillations in the Pacific (PDO, NPGO) dominate the global statistics of TC activity. I also think that looking at number, %cat4/5, and an integral value such as ACE or PDI show really different things, and it is best to use all three in making inferences about causality. With regards to ENSO and Modoki, I think this is noise within the larger PDO/NPGO envelope, but this really has a huge impact on what is happening. In terms of plotting the data, I like to look at a bar for each year, then do a hamming filter on top of that to illustrate the decadal scale variability and trend (e.g. in the .ppt i have previously linked to). Well, in order to spice things up and now bore the audience, I will try and be more argumentative. Wait, you just said you agree with my central hypothesis in my obscure 2009 GRL paper that the NPGO and PDO + ENSO are the dominant movers and shakers of TC activity in the Northern Hemisphere — and as a Supplementary Figure indicates — globally…I put many Easter Eggs in that paper that hopefully staked out my territory… However, this did not stop someone at AOML from hijacking an entire section of my paper and the claiming/feigning ignorance afterwards (hence my dislike for GRL and EOS). The other part of my colorful Figure in the 2009 GRL paper was that the correlation between North Atlantic ACE/PDI and summer/autumn SST was very high over many parts of the globe suggesting the upward trends in both quantities were tricking certain researchers into ascribing causation to correlation. I still believe this is true especially after gruesome amounts of “filtering”. I have had a solution for reconciling ACE and % of Cat 4/5 for over a year now, but after my disgust with GRL, I yanked my submission. We can skype about this and both come to more agreement! Ryan, I just realized theres no link to your 2009 paper in my main post, i’ve just added the link. Strictly speaking, those of us on the other side of the pond don’t have ‘hurricanes’. However we do feel their effect in terms of huge waves and we also do have great storms- some much more violent than others- and in that respect they could be termed 4 or 5 in the context of their severity compared to other storms we get. We are able to go back many hundreds of years with our records that enable us to examine these killer storms in some detail. In that respect we can put those category 4 or 5 hurricanes, based on information dating only from 1970, in a rather broader context and examine if their ‘doubling’ in number has any relevance. Hubert Lamb related this dramatic event to the position of the jet stream. My own house contained beams said to be from one of the wrecked ships. Simiarly, great waves arrive in Britain whipped up by hurricanes. This article shows cliff top storm deposits caused by giant waves with particular emphasis on the period 1700-1900. Tony, there have been some very interesting historical analyses of Atlantic hurricanes, I am thinking of one paper describing extensive data from the Lesser Antilles, I will try to dig it up. There is also a blossoming new field called paleotempestology that is looking at sediments. The sampling of these extended datasets is insufficient to relate them with any confidence to broader climatology. But continued accumulation of such data sets could bring us closer to an actual climatology. And particularly with the higher latitude storms such as those affecting the British Isles and Northwest Europe, these are unlikely to be tropical cyclones but rather extratropical cyclones, which is an entirely different beast. Thanks for pointing out Lamb’s book, I will try to find it, sounds interesting. Can you please substantiate that comment with a link? The coverage by ships and their methodology for collection is extremely poor in all ages and 100 years ago it was sparse in the extreme. Tony, the link for the SST data is ICOADS, see also this broader discussion of the global SST dataset. My colleague Hai Ru Chang has conducted an extensive analysis of sampling of historical SST data points, that I base my conclusions on, but this is not published and I don’t have access to the plots at the moment. In any event, my own analyses (the ppt file linked to previously) in the Atlantic only go back to 1920, which is a compromise between data quality and having enough data to cover the AMO cycles. Thanks for that reference. I have studied ships logs and have access to a number of books of varying antiquity directly citing the measurements taken, for example from Greenland expeditions around 1820. Such records derive from everything from specially mounted scientific expeditions through to vessels merely passing through a stretch of water. There are some 750,000 data points used to construct the temperature of that relatively small area of the UK from which CET is derived from 1660 to the present day. If we take the avereage grid cell as being very roughly a similar size we have equivalent data points ranging from zero to a few dozen covering a period from 1850 onwards. The average grid cell has far too few data points therefore from which we can draw any meaningful conclusions during one year, let alone to discern some sort of pattern over say 150 years. The situation is further complicated by water being very poorly mixed, so one measurent could be very different to another taken 500 yards away. Let us also not forget the methodology. I once met someone who had wielded the bucket and to say this sampling method was haphazard is an understatement. Perhaps the data over the last decade is more comprehensive, but to believe we can draw any conclusions over earlier data in nost parts of the world is stretching a point, let alone to believe we have accuracy to a fraction of a degree. Hope you will be doing an article oin SST’s as I think this is a very fragile piece of AGW ‘evidence’ which wouldn’t be acceptable in any other science. Incidentally thanks for the individual responses-this is a great feature which I hope you will continue. I think you have made a great start to this blog and hope you have found other viewpoints to be beneficial. Tony, I appreciate your insights on this. Whereas most of the “auditing” regarding the surface temperature data record has been on the land data, it is the ocean data where the real problems lie. I will definitely be posting on this. I made a longer comment with two links which has not appeared, yet my short piece at 3.55 did. Do longer pieces get moderated or did it disappear into the nether regions of the Spam filter? This relates to the highly dubious nature of the quality and number of SST measurements and is taken from a post made at WUWT. This chimes very well with the comment I made earlier regarding buckets. I appreciate its anecdotal. “When I served on weather reporting vessels, the wheelhouse phoned the engine room at the appropriate time and asked for the sea temperature, which was taken from a thermometer at the engine cooling water intake. In ballast this might have been about 15 feet below the surface and when loaded maybe 30 feet. Look forward to your SST post in due course and presumably this subject of the warmth of oceans will be covered in the future Hurricane threads you mention you want to discuss. Perhaps we need to be careful with the language of the title of this excellent scientific first post. Absolute clarification of terms may be required, given how this blog came about, and what ‘global warming’ has come to mean, for the media, general public, green lobby groups and the politicians. Some people will see global warming, to mean man made climate change causes more hurricanes. Some people will see, natural global warming, causes an increase in hurricanes. Some people will see global warming to mean, natural global warming resulting in an increase in hurricanes, and the possibility of a human signature in that increase. What % of each unknown as yet. Which leads me to my question, what additional data, and what time is required to have enough data, to be able to attempt to identify a human signature from the climate (natural variability and trend) with a high degree of confidence. Similarly what techniques would be used, statistically based I presume. Some of this comment may belong on the open thread, but think it is important to mention it here. Judith pointed me to a paper on some blog (collide a scape?) where up to 60-70% of warming in the 90’s was now being thought to be due to a natural source… Presumably the Climate models did not take this into account. Barry, attribution of any change in hurricane activity to AGW will not be simple, it will require more and better data, better models, and better theories. I suspect that there is some signal of AGW in the intensity increase, but it is probably swamped by natural variability. In my 2006 paper, i said we needed another 10 years. Well 4 years have already past, we’re not any closer since we now understand the problem is more complex than we originally thought. No simple answer, unfortunately. I think that is the problem, the politicians (and media) demand a simple answer. Thus careful clarification always required. This paper so easily twisted by the media, to say Global Warming (meaning AGW or CAGW) cause increased hurricanes.. The fact that no human signature has been identified, or it may be not able to be identified, just gets lost.. I don’t mean to be harsh – but ‘suspect some signal’ sounds a little bit like P Jones’ ‘gut feeling’ where he admits no evidence for, beyond x years experience. So how do we test/observe/ the null hypothesis, ie there is no AGW effect on hurricanes. presumably with a no AGW effect baseline… However I am at a loss to see how this may be done. Be careful of the media, but I’ll put that in the open thread. Hurricane strength is a factor in ACE. Now that we have satellite observations, we have seen wind shear decapitating developing hurricanes, limiting their ultimate intensity. I do not have the data, time, background or talent to link these to multidecadal weather patterns, but it might be interesting to someone who does. 1. The IPCC Report is an unreliable source of information on hurricanes. “After some prolonged deliberation, I have decided to withdraw from [IPCC AR4] because I have come to view the part of the IPCC to which my expertise is relevant as having become politicized. In addition, when I have raised my concerns to the IPCC leadership, their response was simply to dismiss my concerns. 3. Climate models are an unreliable source of anything until successfully tested. 4. I don’t think your conclusions – especially the probabilities – are justified by the body of your post. [Just what I felt when I first read the IPCC Report – it was reading the IPCC Report that first made me sceptical, until then I had been convinced and read the IPCC Report only to learn more]. Sorry if this sounds a bit brusque, it isn’t meant to be, but I need to keep comments short here and I am genuinely short of time. Try to read it as helpful constructive comment!!! Just a comment, delete as you wish. Whilst I admire [and am deeply impressed] by you responding personally to almost every post, I fear you may be making yourself a hostage to fortune. I cannot see how you can possibly sustain this level of interaction and when it reduces – as surely it must – there will be adverse commentators. When I was interviewing a 95 year old survivor of Katrina who has lived her life on the coast of Mississippi and asked her about storms, she talked about a storm which had hit her parents in the 19th century which had pushed a surge into what was then called Scranton, Miss., and wrecked it to the point that as the town rebuilt, it was renamed Pascagoula. Pascagoula survived Camille- one of the only Cat. 5 storms to actually make landfall as a Cat. 5 storm, and Katrina- a strong 3- to weak 4 at landfall- with worse damage from Katrina due primarily to the surge, but also to its very slow transit time, exposing the region to hurricane winds for a long period of time. I think before we accept a consensus about cat.5 storms, we had best get a good handle on history. Hunter, the 1880’s and 1890’s were apparently an absolutely wild period for landfalling hurricanes in the U.S. My statement is only about global hurricanes for the period 1980-2009.
smaller denominator! working with percentage data is tricky as you have to be on the look out for correlations between the numerator and demoninator. the distribution of the ratio of two normals is not normal. somewhere around here I have the formula for correcting your CI for the presence of positive or negative correlations between the numerator and denominator. If there is any relationship between the two ( more smaller hurricanes make bigger hurricanes less likely.. for example only ) then you cannot do simple stats on the percentage. Well, you ruined everyone’s fun by pointing out the obvious. The number of hurricane days has collapsed — and is highly correlated with ACE. On a storm-by-storm basis, this is not true. That was my point in one of the other threads. We need to look at the individual characteristics of each storm’s duration and intensity/ and track location. Ryan correct me if I am wrong but I never seen anyone use the proper form of estimating the confidence interval on the “percent” of cat4/5 storms. I might be wrong on this, sometimes my eyes glaze over. If there is any correlation between the total count of storms and the count of strong storms then that has to be accounted for. the math is straighforward. The sample size is so small for the basins except for the Western Pacific which can have a lot of supertyphoons in an El Nino year. Thus, as you suggest the % may not be meaningful — or at least no more informative than saying year-to-year variability in genesis locations leads to more major hurricanes. If you take major hurricanes, Cat 3+, the % that is reported largely disappears. Thus, there is sensitivity to the choice in the ratio of Cat 3,4,5/total hurricanes. A distribution analysis was done by Elsner et al. (2008), but the conclusions leave a lot of room for interpretation. I mean, the trend in the % largely disappears. Lots of interannual variability. Nice to see you have your own internet home now. whereas the red bars in the first figure (number of hurricanes) don’t show an increasing trend. Since that figure purportedly shows global number of hurricanes, it stands to reason that outside of the North Atlantic the number of hurricanes decreases? Guess I’m just a bit confused as to where you talk about global and where about more regional numbers. Hi Bart, I didn’t cover regional in the actual text (the text was already too long I thought); I included this in my assessment since the other assessments commented on this topic. For some plots on the North Atlantic, see here. I don’t think my conservative statement about North Atlantic hurricanes would be disputed by anyone who has published on this topic. Your first bullet point in your conclusions is a classic example of a ‘true but misleading’ statement. It seems to have been lifted unquestioningly from the IPCC SPM. In fact if you look at fig 3.40 in the IPCC report you can see that the statement is doubly cherry-picked, since other regions show either no increase or a decline, while in the Atlantic there was a minimum around 1970. An alternative conclusion would be “There has been a decrease in activity in the East North Pacific since 1990”. Your selection of literature is also biased. Like the IPCC you emphasize Webster et al (on which you are a co-author) and Emanuel, and you focus on the twisted statistic about the proportion of cat 4 and 5. But there is no reference to Pielke et al 2005, or Maue 2009, or any of the papers by Chris Landsea, or Wu et al 2006 who questioned the results of Webster et al., or Klotzbach 2006 who also contradicted Webster and Emanuel. Why not? And no mention of Landsea’s resignation from the IPCC regarding its exaggeration over this very issue. See points 10 and 35 on my website for graphs and links. Quite right, just show us the raw data with no ‘analysis’ and no straight lines draw through it! I have read the Makarieva and Gorshov papers , especially the 2009 is relevant . The 2010 is more general and relates to hurricanes indirectly. Of specific interest is their interactive discussion with reviewers that they published . I don’t know where you found that they were “biophysicists” – they work in the theoretical physics division of the nuclear physics institute (St Petersburg) and their focus in publications is on thermodynamics (applied to living beings too). a) They know what they are talking about and are definitely knowledgeable in thermodynamics. b) They refuted all arguments against their thesis during the review process. Convincingly. c) It is likely (>50%) that they are right. But if they are right, Emanuel is wrong. As you wrote “that Emanuel has submitted a response to this paper” (I assume that you meant the 2009 paper because the one from 2010 doesn’t really call for a response) , have you something more substantial? It seems rather hard to oppose something new that the reviewers did not see yet so I am interested to read what Emanuel found. Tomas, I also find the Makarieva papers very intriguing. I recall that Emanuel’s issue was with the use of V-squared rather than V. I emailed Makerieva hoping that she would post here (she has posted on WUWT in the past), but she is in the field without email access. Did you try galinast@thd.pnpi.spb.ru which is the adress of the institute which would then forward the mail farther to V.Gorshov and A.Makarieva? I find it really hard to believe that both are for a long time in a place without email access. 1) 2005 was a big hurricane year, we have not had many big hurricanes years before or since, and the area of cyclogenesis has not changed, THUS how can the warming actually be causing more hurricanes? Just an old human geneticist. Regarding hurricanes, you have fallen into the trap of overanalysing a detailed short time period dataset (and drawing conclusions based on it), whilst ignoring the bigger longer term picture. There is a fantastic 150 year record of hurricane landstrikes on the Atlantic coast of the US which clearly shows hurricane strength and frequency increasing since 1970 (as per global satellite analysis) ….. but ALSO shows that the last 30 years have not been exceptional compared to the total period (since 1850). Hurricane frequency and intensity was greatest during the 1930′s, 1940′s and 1950′s. Any conclusions you draw from the satellite analysis of the last 30 years which contradict the larger picture are totally worthless. If you infer that hurricanes have been getting stronger in the last 30 years from global warming, you have to be able to explain why there were more of them and stronger during the 30′s, 40′s and 50′s. Otherwise the scientific conclusions are flawed. Its that simple. That’s not exactly true … your 3rd conclusion bullet states “It is more likely than not [>50%] that the maximum intensity of the strongest hurricanes would increase in a warmer climate. ” If this doesn’t infer variability (increased maximum intensity) due to global warming I don’t know what it says. Whilst you couch it with statements of uncertainties, it is a pretty clear conclusion. However, it is directly contradicted by the actual data of the last 150 years (where it exists – US Landfall). Either your conclusion is flawed because it isn’t supported by the data, or actually the 30’s, 40’s or 50’s were warmer than the present (ie. global temperature analysis is wrong). Its a fair point that it could be regional variability (decadal scale) but if this overprint so thoroughly masks the warming conclusion (as it must do in the 30’s, 40’s and 50’s), its hardly worth worrying about. I apologise for having written this without reading your pdf (am having problems opening it in my browser) but promise to do so and will revert later. I may be overly sensitive, but I find the following account subtly misleading. The timing of the publication of these papers within weeks of Hurricane Katrina’s devastation focused intense media attention on the topic of greenhouse warming and increasing hurricane intensity, although neither Emanuel or Webster et al. directly attributed the tropical cyclone changes to greenhouse warming. “[W]ithin weeks” implies a timeline, where Katrina preceeds the papers, “[t]he timing” implies intent to publish the papers in the wake of Hurricane Katrina, in order to maximise their impact on the public. So let’s look at the actual timeline. Hurricane Katrina formed over the Bahamas on 23 August, crossed Florida and made landfall in Louisiana on 29 August. So both papers were accepted for publication before the formation Katrina, Emanuel’s paper was even published in print three weeks before. The authors of both papers make it furthermore clear that they suspect causation by global warming, something you omit in writing “although neither Emanuel or Webster et al. directly attributed the tropical cyclone changes to greenhouse warming.” I consider it an important omission, when the interpretation of data by the authors, even if tentative, is withheld from the reader, especially so when the remark is made to contrast the papers to the coverage in press that makes the connection. Well that is the point. Both papers were submitted before the start of the hurricane season. Pure crazy serendipity resulted in them both being published within weeks of Katrina’s landfall. Exactly what is misleading here? The point that both papers were published before Katrina was not made and did not come over. As I said, in common parlance the highlighted phrases imply timeline and intent. With your edit my major objection to that sentence is cured. IMHO, the emphasis you chose to put on “neither E. nor W. directly attributed” (opposing this to the press coverage) still makes it look like the connection between GW and Hurricane intensity was made by the press only and not by the authors in their tentative/speculative interpretation of their data. All three of these topics are being investigated by the Georgia Tech group, so it would be relatively easy to spin up threads. In any event, I wouldn’t do a hurricane thread more frequently than say once every 2-3 months. IMO, the more TC threads the better. Perhaps some discussion about the projected increase in vertical wind sheer in a warming world and effects on cyclogenesis? I’d like to see more on the genesis of hurricanes. Maybe you should not rule out letting the storms lead on timing and distribution of hurricane threads. Some great storms and plenty of media coverage are in season and it seems any storm has the potential to teach us something new. Additionally, there’s always the matter of putting what we are hearing, or think are hearing (want to hear? – maybe, sometimes) from the media into perspective when it comes to large weather events. How about if hurricanes are correlated with global warming or cooling on a 1 – 6 C per century scale. If so, what is the best measure: intensity, frequency, total energy, some combination, or something else entirely? My thought here is if your paper depends on the temperature record, is that record of a high enough quality or long enough to use in hypothesis testing? If it isn’t, any conclusions are premature. Hi Judith. Got here via WUWT, and am familiar with your posts there. Your new blog is a welcome addition; I’ll drop by from time to time. Though I often disagree in substance, I like your tone, and I think you avoid much of the spirit of propaganda that dominates many pro-AGW writers. First, I agree with your assessment of the models. Hurricane and other storm activity depend too critically on sub-grid events for current models to be relevant. Second, why did you not discuss total storm energy (or did I miss something)? It is a serious stat, which you’ll find analyzed periodically at WUWT, arguably more important than MPI. Third, what is often missed in these discussions is the clear historical record of storm activity during the MWP, the Roman Climate Optimum and intervening cold periods. Invariably when climate turns cold, sea trade and travel are curtailed due to severity and frequency of storms, while it expands during warm periods with good seafaring conditions. This alone suffices for me to take these contemporary “studies” with a huge grain of salt! In one of my posts above I comment on the apparent greater persistence of storms in cold periods than in warm ones. We have got into the habit of taking as a given that warm equals greater intensity of storms due to warmer SST’s etc but this is by no means demonstrated by the facts. I am hoping that when Judith does one of her articles on SST’s that she will look at all aspects of the subject. I agree Tony. I think this is an important line of investigation. The scholarly understanding of climate history during the Holocene is laid out pretty well in this book by Patrick Nunn, a professor of oceanic geoscience who is no slouch and certainly can’t be characterized as a “denialist”. The page I reference is one of many on changes in storm activity over the late Holocene; the picture painted is pretty consistent: cold — more storm activity, to civilization’s harm; warm — greater storm activity, to civilization’s benefit. Uh, I mean warm — less storm activity, to civilization’s benefit. No statistical analysis of the data is presented here; I leave that to others to decide the best way to assess the magnitude and significance of the trend. Your first approach is appropriate: let us leave off analysis. In fact, little can be inferred reliably about trends from these time series. In the second statement, however, you assert that no trend shows in the first series. Sorry, I disagree. No analysis is needed to see a clear overall decreasing trend. It’s significance cannot be judged visually, but it is clearly there. There is also a clear, mild increasing trend in the data among the Cat 4&5 data, but again: is it significant? What you appear to infer from the third (Percentage) stat, is simply wrong. Grant for a moment my claim that there is a clear downward trend in total number of storms. Now suppose Cat 4&5 data were perfectly constant (humor me). The third stat would still rise. Yet this would not correspond to global storm activity “getting worse” in any meaningful sense — quite the opposite! Am I wrong to detect that this is what you wish to suggest? Further if, as I believe, the trends in the first two stats are indistinguishable from noise, the third stat compounds a fictitious trend. Surely your scientific alarm bells should be ringing: if one number is likely too big and another too small, then the error in their ratio is greater than in either one. But that is where you appear to place the greatest amount of confidence. Please rethink this. A quick look at the data shows the trends in both % category 4&5 and total number of category 4&5 are statistically significant at 95% from 1980 to present. But I note that this significance is entirely driven by the the low number of more intense storms from 1980 to 1987. There is no steady secular trend that is evident in the data. Both of these trends completely disappear if the first 7 years of data is not included in the analysis. It seems possible that longer term cyclical behavior in hurricane frequency and intensity, perhaps related to the NAO, could easily be misinterpreted as a ‘trend’, rather than a portion of a longer period cycle. If the hypothesis is that warmer sea surface temperatures will increase the intensity of hurricanes, would a plot of sea surface temperatures (in the ocean regions where hurricanes form) versus hurricane intensity not be a ‘cleaner’ test than at simple time series? Steve thanks for your analysis. With such a short data set having so much natural variabiity, it is very difficult to attribute the variations. A plot of SST vs hurricane intensity basically gives you a correlation dominated by the impact of ENSO in the Pacific (which is where the majority of the hurricanes form). Does the correlation with ENSO show the expected increase in intensity with warmer SST’s? …not the SST where the typhoons actually occur though…ENSO moreso modulates the locations of genesis, but the water is always pretty darned hot there in the “warm pool”. The WPAC is only 83% below normal currently due to the ongoing La Nina — no surprise at all. There’s been one-major (Cat 3+ typhoon) [barely] named Kompasu. The entire basin ACE so far is less that what Igor will muster on its own. 1980-2009 is too short a period to be significant. It cannot be used to determine any projectable trend. Your 2006 paper is logically flawed, and omits important statements from its Summary. Your third “Conclusions?” bullet above should perhaps begin “It is not possible to determine whether hurricane intensity would increase in a warmer climate.“. Mike, thank you for your thoughtful analysis. The nuance of how to phrase the statements is a challenge. But I do not agree with your statement: “It is not possible to determine whether hurricane intensity would increase in a warmer climate.“ We have a hypothesis on the table: hurricane intensity will increase in a warmer climate. Then we assemble the evidence for the hypothesis (green) and against the hypothesis (red). Then we contemplate what kind of information would be needed to provide a convincing test of the hypothesis, and assess how that measures up relative to the evidence that we do have (white). I think this is the appropriate way to reason about this issue. The book on Holocene ocean climate I cite here appears to provide a pretty strong scholarly position that the default assumption should be what the longer historical record indicates, thatstorm activity is less intense — as it impinges on human activity — during warm periods than during cold ones. Based on Dr. Nunn’s summary of what is known from Holocene data I would have no confidence in a hypothesis test on this question that relies solely on decades-scale data. You can’t infer anything useful from noise. My first point applies : “1980-2009 is too short a period to be significant. It cannot be used to determine any projectable trend.“. From this it follows logically that “It is not possible to determine [from 1980-2009 data] whether hurricane intensity would increase in a warmer climate.“. In 1694 Britain-an exceptionally cold year-October brought frost, snow, and ten days of exceptional winds which culminated in a storm so severe that it destroyed coastal dunes, buried a village in nearly 100 foot of sand and made a pauper of the land owner whose estates had been buried. We have many such records during cold times-in my opinion they outnumber those from warm times. When was the last time in recorded history that Britain was hit by a hurricane? According to the HURDAT record, I don’t think this has ever happened. You are confusing extratropical cyclones (which derive their intensity due to the thermal gradient b/w the tropics and extratropics and would be stronger in a cooler world) with tropical cyclones that are in general NOT derived through horizontal thermal gradients. Hurricanes are far far outside my areas of experience and expertise, so the following might not make any sense. Why is the association made with the level of the sea surface temperature in contrast to the difference in the driving potential between an energy source ( the ocean ) and sink ( the hurricane / TC )? I have read a few papers on hurricanes / TCs, and tried a few Googles, looking for a summary of the mass and energy budgets for hurricanes without success. Could you maybe point me to a report or paper that provides this information. I’m particularly interested in the relative magnitudes of all the energy and mass sources. A summary in a table would be especially useful. Especially, I’m interested in finding out why the energy addition into the TC is dominated by the ocean-storm interface in contrast to all the other sources of energy addition. And why, for example, the temperature of the ocean surface is taken to always be greater than the temperature of the TC. Dan, you raise an important point. A quick reply now, I will look up some other papers this afternoon. The papers cited in the context of maximum potential intensity take a heat engine approach to this. One of the key challenges is getting actual measurements in a hurricane. In particular, the surface evaporative flux in a hurricane pretty much defies direct measurement, but we do have a few aircraft measurements of latent heat flux in the atmospheric boundary layer of a hurricane. We have a paper in review that attempts this measurement from satellite, and a follow on paper that looks at heat, water, and mass budgets of individual hurricanes from satellite and aircraft observations. Altogether too much political baggage in that interview, and not enough science. Since there are other factors known to (or strongly suspected to) influence tropical cyclone formation and intensification, like MJO and vertical wind shear, it would perhaps be useful to look at how these other factors are expected to be influenced by a general warming. I have noted several times that I do not really need to read the NOAA forecast to tell if an Atlantic basin cyclone will strengthen; a look at the time sequence satellite images usually shows clearly if there is enough wind shear present to inhibit strengthening (since I live in south-central Florida, this is has become a routine activity for me during hurricane season!). You can see the top being blown off the storm if the shear is strong. Related to the issue of possible changes in hurricane intensity in a warmer world, I still think it’s relevant to point out the difficulty we continue to have in making short-term intensity forecasts. Case in point, Hurricane Julia. Unless someone can provide a model (statistical or dynamical) to prove otherwise, Julia’s rate of intensification as well as its maximum intensity (115 kts) will go down as a major miss this season. In my opinion, these systems and in general the lack of improvement in short-term intensity forecasts, in spite of serious monetary investments, require us to seriously reconsider the dynamics and thermodynamics associated with hurricane intensification and maximum potential intensity theory. Perhaps we should finally appreciate the truly chaotic nature of the process, and therefore its very limited predictability. A 19% increase in wind speed need to change an average Category 3 storm (120 mph) into Category 4 (142.5 mph). Given the modest change in SST in the short period since 1980 (0.5 degC? ), rising SST’s are extremely unlikely to be responsible for the recent increase in the percentage of Category 4 and 5 hurricanes (unless the CCSP report is grossly wrong). Isn’t this conclusion rather obvious? Yes, that report is deprecated and should be put into the dustbin. The Knutson et al. (2010) Nature Geoscience consensus is more rigorous. The quality of the whole CCSP report is irrelevant. The quality of the original paper(s) that concluded that wind speed increases 1-8% for a 1 degC rise in SST is relevant. Unfortunately, I haven’t studied those papers and would be delighted to hear an expert’s opinion of them. If this information is reliable (a reasonable assumption), shouldn’t it be used to eliminate increasing SST as an major cause of recent hurricane intensification? Frank, let me be more precise. The certainty levels indicated in the CCSP report on hurricane metric changes with respect to climate change are different in Knutson et al. (2010). The Supplementary Material to K10 is where everything is … somehow it was not highlighted as much in the regular article, but I suspect that was a space saving decision. Let’s say 2 studies on hurricanes are done – one on hurricanes(say in 2005) and one on cyclones (2010). The first concludes that hurricane numbers will likely rise in response to warming. The second comes five years later, and the methodology and understanding may have developed since the first study. And here they conclude that cyclone activity is more attributable to other causes than warming, than previously thought. And further that there are indication of a lower frequency, but conclusions are unclear. When these two papers are given confidence levels by the IPCC, they will likely state that the confidence for increased hurricanes is higher than the confidence for less cyclones, even though the prediction of less cyclones was based on an advancement in the scientific understanding compared to the first study. The average reader would conclude that the level of scientific understanding in the first case is higher than in the second case, while the direct opposite is true. Then what use is the word “confidence”? Rilke, your analysis is correct. Early on in the investigation of hurricanes (ca 2005) the discussion was about red and green. Now we understand that there is a lot of white. So our understanding has increased, but our confidence level is lower. A seeming paradox, but that is how science works. Thank you for your reply, Judith. I just feel that that the IPCC should be clearer on the level of scientific understanding here. Although confidence drops as the white area increases, the IPCC simply assigns the value “less confidence”, without explaining that the lower confidence stems from a better understanding of the science, thus leading readers to believe that “less confidence” actually means that the sdudy is flawed somehow, a minor study, etc, and that it’s conclusions should be given less weight and are less likely to be correct, compared to previous studies based on a weaker understanding of the science, but with stronger conclusions. I think the whole IPCC system of assigning percentages and values like “confidence”, etc, is a muddy filter between the science and the readers of the reports. This is not completely fair. Back in 2005 and 2006, there were several comments published in Nature and Science on data and methodology issues with the Webster et al. (2005) and Emanuel (2005) papers. These comments do not get the publicity, but are important nonetheless in putting the results into the historical context of data quality. Similar issues are occurring still today as the burst of hurricane activity in the North Atlantic is being described as the “most ever” and record this and that. The data quality issues are in the footnotes if at all. W05 and E05 were the first papers that used the best-track as if it were truth and went to town with filtering and correlation. I would say then that are confidence level in data quality has gone down and uncertainty in the extrapolations / correlations from W05 and E05 has gone down. But, no serious scientist working on TCs dismissed the idea that natural climate variability was important. It’s just that they filtered it out and instead only tested hypotheses that dealt with global warming. They completely missed the point understanding how TCs and climate interact. Pingback: Scan the Truth . Com » Blog Archive » Hurricanes and global warming: 5 years post Katrina | Climate Etc. Uncertainty – “White” in this discussion – seems more important than Red or Green for some purposes. With Red certain, one set of decisions (e.g. building on the coast) could be made to best advantage; with Green proved, another (say emergency response planning); with a fixed ratio of probabilities between Red and Green, a third set of decisions to optimize chances would follow (like insurance rates) and could be said to be correct for given odds. In White, there is no optimal decision; wasted opportunity is maximized in every case in a Game Theoretical sense. Red, Green or Red/Green diminish in value (allowing political suasion to override prudence) as White grows. Red and Green of whether severe ocean storms in any sense are part of Climate Change due to AGW is thus too narrow a target. Do we not only need show whether White increases, and by how much, to allow future costs of ocean storms to be associated with anthropogenic GHG emissions? Aren’t those calculations much simpler to derive? Your conclusions make a lot of sense, except for the first one. It is too generalized, in my opinion you should follow the temperature graph for the 20th century and see the correlation, which shows that the 1930th were much more intense and the 1970th much less, then again there is a rise in the 1980th and now there is a drop in intensity. This all show that there seems to be a correlation between surface temperature and hurricane intensity, which makes much sense. The only real question is what is causing the change in temperature, there is no scientific proof that co2 is causing it, and that co2 concentration is even caused by humans. So you cannot predict with any kind of certainty what the temperature will be in the future, so why should anybody assume that it will be warmer and therefore cause more intense hurricanes? Who has predicted the cooling we are witnessing in this decade? Kerry Emanuel is a believer in the AGW theory, and he has issued his 2006 statement based on his personal beliefs, not on science. So maybe I should move again this time to the thread of AGW? Maury’s work spanned 1840 – 1860. If original data were compiled from ships’ logs from 1780 or so, logs and the working papers may have been retained in archives. Granted, they may be sparse. Some indirect estimates of wind strength could also be made from sea states if mentioned in the logs. actually this sounds quite interesting, will follow up on this. Pingback: Epidemic of false claims | Climate Etc. Pingback: Frankenstorm | Climate Etc. Pingback: Why climate disasters might not increase concern about climate change | Climate Etc. Looks like the Chief has yet another sockpuppet, and he finally seems to be writing about something he knows about.